Wedding Dresses: Haute or Hot Mess? Trying to pick out a dress for The Big Day can be so overwhelming. It seems like it should be easy enough, doesn’t it? I mean, we manage to dress ourselves each and every day with little to no problems or complications. Then why is it that we have so much trouble picking out one dress? Just one. Oh, I already know the answer of course…it’s because that one dress has to be the PERFECT DRESS. It has to be THE ONE. (On a side note it is extremely difficult for me to not make a cheesy reference to the sci-fi movie The Highlander right now…oh forget it…I’m helpless to resist.) “There can be only one.” But how do you know the one is really the one? What if it’s merely the one for right now? Do you want your dress to be haute or a hot mess and how can you be sure which is which? There’s nothing wrong with being stylish and fashion forward but following flash in the pan trends are a one way ticket to a future filled with the mockery of your wedding photos by your children and grandchildren (and if they’re REALLY bad and you’re extra lucky, you’re great-grandchildren). Don’t believe me? Check out these world class wedding dress travesties. Distracting from the awful wedding dress by using even worse bridesmaid dresses = genius. The florist must have recognized the fashion faux pas by concealing it behind the insanely massive bouquet. Too bad it couldn’t hide the veil. Princess Di was lovely. Her gown?…not so much. The perfect dress for women who are passionate about feminine hygiene. Even Designers Make Hideous Mistakes. Even our beloved designers seem to have trouble distinguishing between what’s hot and what’s not. Yes, many runway looks are never intended to be worn as-is, straight off the runway for events. There is usually a bit of tweaking and toning-down of outrageous details that are done before they are worn by those who can afford the hefty price tags…please note the use of the word “usually.” There have been instances of pieces being worn straight off the runway with rather unfortunate outcomes. 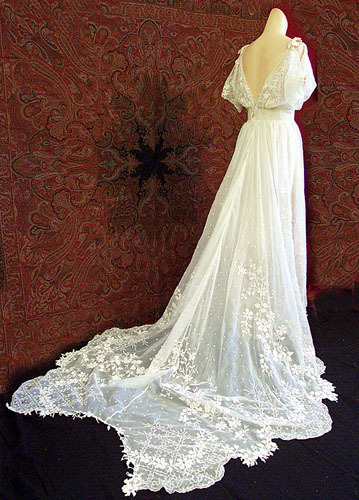 Here are a few designer pieces which I pray with all my heart never make it onto any bride anywhere…tweaked or not. God save us all if they ever do for it will truly be a sign of the end times. Really, Yves Saint Laurent? Really? I don’t think Mother Nature herself would touch this with a ten foot pole…no matter how you prune it. You may now kiss the bride…if you can reach her. Even my beloved Jenny Packham gets it wrong from time to time…the poor girl looks like she’s been attacked by an ostrich. Love the 1960’s influence with this Dior gown, but I don’t know very many brides that want to look like the reception tent. 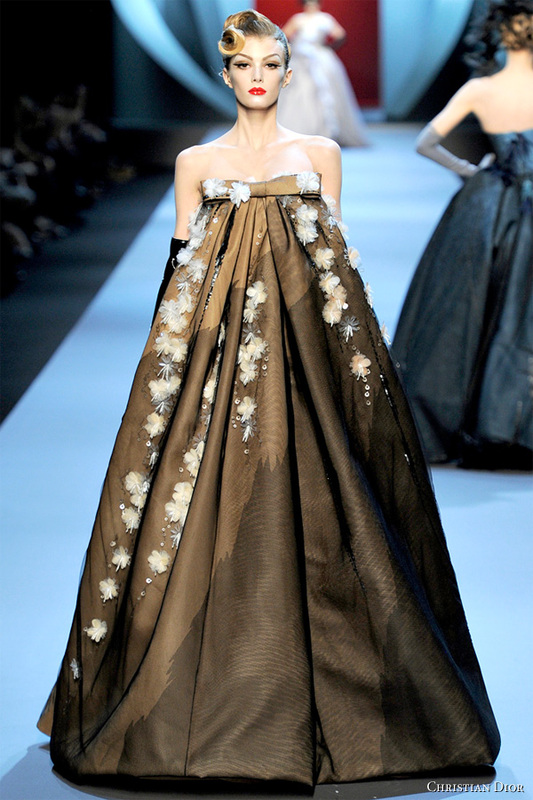 Even those who kneel at the house of Chanel can’t deny that this gown borders on blasphemy. Are you on the fence about whether or not a gown will stand the test of time? Are you worried that good taste mean not being able to express your personal style? Fear not. When in doubt just stop, take a deep breath , channel a classic style icon and ask your self “What would Audrey Hepburn do?” (or Grace Kelly or Dita Von Tease…you get the idea.) Connect with these goddesses of fashion and taste and you can’t go wrong. Coco redeems herself with a show of exceptional taste with this vintage Chanel gown. Classic, cute and just a little quirky from my beloved Jenny Packham. So very Audrey. A dress to make Grace Kelly proud. What does your dream dress look like? Do you already have one picked out? Still shopping around? Feel free to leave comments and links to your favorite gowns (or more fashion travesties) in the comments section. Alli Woods Frederick is an artist, photographer, writer, reiki master, intuitive & zombie slayer extraordinaire who blogs at KissesAndChaos.com. She is also the art editor for All Things Girl Magazine. Her feline companion, Mischa the Wonder Cat, is currently being considered for sainthood. She has a deep and abiding love of fancy dress, Bruce Campbell, Bob Hope, Adam Ant, the 1930′s & tea parties. She has a borderline unhealthy obsession with ghosts, shoes, zombies, the deep south, England and glitter, though not necessarily in that order. Her photography has been featured in F-Stop Magazine and All Things Girl and her writing has been featured on HelloGiggles.com, The Goods, Kind Over Matter and in The Radical Uprise Issue #021: Grow/Create. Her photography has been exhibited at Springbox Gallery in Portland, Oregon. 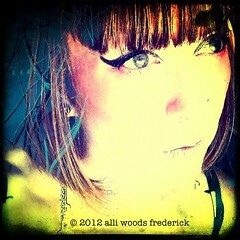 To view more of her photographic/artistic work visit AlliWoodsFrederick.com. Posted on May 30, 2012, in Weddings and tagged alli woods frederick, audrey hepbrun, Chanel, designer dresses, Dior, fashion disasters, fashion faux pas, grace kelly, guest blogger, haute, hot mess, Jenny Packham, kisses & chaos, picking out a wedding dress, Princess Di, trends, trendy, wedding dress do's, wedding dress dont's, wedding planning, YSL, Yves Saint Laurent. Bookmark the permalink. Leave a comment.